Slam Dunk Festival 2019: A Pop-Punk Paradise. Back to fill that metal, pop-punk and alternative music shaped hole in your life, Slam Dunk Festival returns with a vengeance this May. With humble beginnings as a simple pop-punk club night at The Cockpit venue in Leeds, the festival has gone on to become something of a rite of passage for fans of the genre. 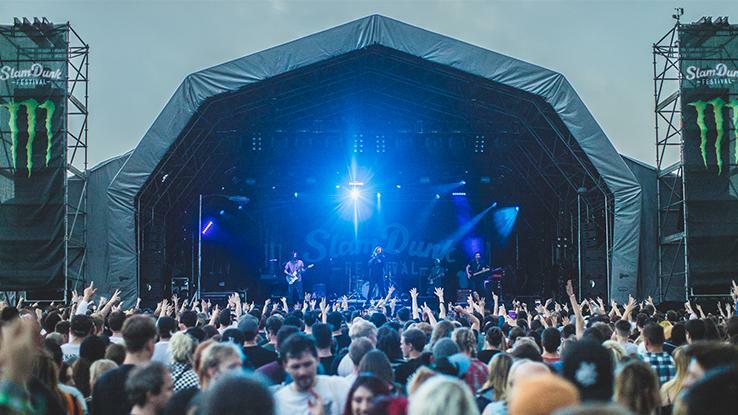 Slam Dunk is hosted in two separate locations; Temple Newsam Park in the north (25th) and Hatfield House Park in the south (26th), across the May bank holiday weekend. With fans catered for across the nation and all-star lineup, you can be sure that this year’s festival will be the best ever. If a sea of black t-shirts and ear splitting music is your thing, buy your tickets now. Who Is Playing The Fest This Year ? So you want some of the biggest names on the scene in a one day convenient package. Well Slam Dunk has you catered for. Top of the bill, American rockers All Time Low will be headlining. The group have come a long way from their Suburban roots as a high school Green Day cover act. Now with seven studio albums, the last of which, ‘Last Young Renegade’ won Rock Sound Awards album of the year, the bands legacy is unquestionable. Their performance this May is sure to be the latest in a career of meteoric successes. Canadian outfit Simple Plan will also be performing at Slam Dunk. As one of Canada's biggest pop-punk exports, the group have been instrumental in keeping the genre fresh with their energetic sound. The band's first album ‘No Pads, No Helmets...Just Balls’ featuring Good Charlotte’s Joel Madden and Mark Hoppus of Blink-182 fame was a monumental hit, selling over 4 million records across the world in 2003. With over 15 years since that first double-platinum release and four more albums under their belts, Simple Plan has become a well-oiled touring machine. With a suspected new release in 2019, catch them at Slam Dunk for a showcase of old classics and new material. True legends of the scene, Welsh metal band Bullet For My Valentine will be showcasing their unique style this May. As one of the biggest metal groups to come out of the UK, BFMV have become industry giants in the post millennium metalcore scene. Collecting accolades and recognition in the metal community such as Kerrangs Best British Band, won for three consecutive years, BFMV have cemented themselves in the history books. Now as established veterans with a solid, well-seasoned performing style, we wish them the greatest luck with this summer’s performance. Gracing us with a rare performance all the way from the US, trailblazers New Found Glory will also be headlining. As genre defining pioneers since the 1990s, the group have been regarded as ‘godfathers of pop punk’. All Time Low, a fellow group on this year’s line-up is named after an early New Found Glory lyric; there is no higher praise in the community then that. By providing the blueprint alongside Blink-182 and Green Day that many other groups have followed, New Found Glory have been instrumental in creating the music that you love. So come along this May and bear witness. With these groups and many more, this year’s festival is shaping up to be something truly special. Follow the link below to get a better picture of this year’s line up. Depending where you are located in the UK, either the north or south location might be more manageable. Slam Dunk North is located within the city limits of Leeds in Temple Newsam Park and will be held on the 25th of May. If traveling by car the site is on a junction of the M1 motorway. If traveling from Leeds town centre, take a short shuttle bus trip from Leeds train station. Slam Dunk South is located in Hatfield House Park which is directly opposite from Hatfield train station on the 26th of May. If travelling by car, Hatfield House Park is very close to a junction of the A1 motorway. There is also a regional bus stop located close to the site. For more information of the north and south dates and transport connections follow the link to the official site at the bottom of the page. Tickets for both north and south dates are still available but they won’t be forever. To avoid disappointment get yourself on the official page now to book tickets. A link can be found at the bottom of the article.